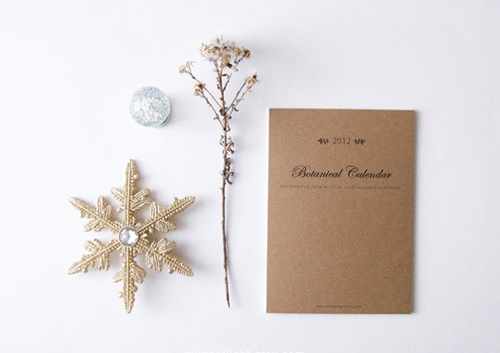 To begin the new year, I love the idea of a botanical calendar to showcase the best of nature's offerings each month. Buds, cones, leaves, seeds and roots are arranged in a way for us to take notice and appreciate. Romina Bacci, who resides in Plano, Texas, is the artist responsible for these lovely creations. She admits she's obsessed with nature, photograpy and graphic design and her bevy of talents shine through in this gorgeous calendar for 2012. I first found Romina on Etsy and as a nature lover myself, have long admired her work. Her nature prints easily complement a rustic, Southern decor. Yet with a thoughtful, deliberate design, her prints work seamlessly for the modern aesthetic as well. Romina is a storyteller at heart, sharing, "I love the narrative aspect of photography." It's nice to have an art piece that tells a story- an art piece that can offer something different every single time you look at it. Romina is constantly collecting new items for her botanical creations. As nature is perfect in its design, there is an endless array of inspiration just outside her front door. 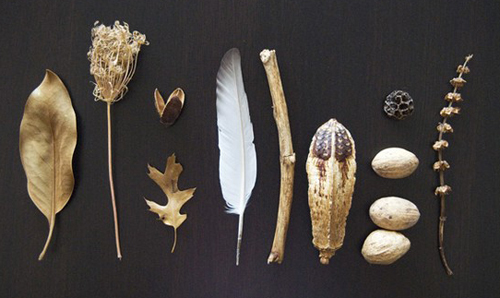 As she states, "At some point, my studio looks like a very messy natural history museum." I love and admire that through that mess, she finds order every time. Thank you for sharing your lovely work with us Romina and inspiring us for the new year. May 2012 be a year where we all take a little more notice of life around us. We are so fortunate that there is something to invoke a little awe and wonder every moment of every day...just as long as we remember to open our eyes and look.